Cloud Foundry was created by VMware to streamline deployment for application developers, application operators, and cloud operators. Then in April 2011, Cloud Foundry was announced as open source under the Apache 2.0 license, with the pitch to developers that they could code in the language and Web framework of their choice without worrying about the IT environment. In February 2014, VMware spin-off Pivotal announced the formation of the Cloud Foundry Foundation, with Pivotal, EMC, IBM, Rackspace, and VMware as Platinum sponsors. The foundation has since expanded to 33 members and 42 contributing companies. One differentiator for Cloud Foundry is support for Pivotal HD Hadoop MapReduce, HAWQ SQL for Hadoop, and GemFire XD analytics. Another is the availability of the Pivotal Mobile Services Suite, thanks to last year's acquisition of Xtreme Labs. Pivotal's big data services and mobile services are both now integrated with Pivotal CF, the company's enterprise version of Cloud Foundry. Several Cloud Foundry Foundation members have released their own distributions of Cloud Foundry, including ActiveState with its Stackato product. The free Stackato Micro Cloud comes packaged for VirtualBox, VMware Fusion/Player, VMware vSphere, and KVM. While the Micro Cloud Foundry VM has not yet been updated to Cloud Foundry v2, you can install Cloud Foundry open source locally using either bosh-lite or cf_nise_installer. Bosh-lite supports VMware Fusion/Player, VirtualBox, and Amazon Web Services, while cf_nise_installer only supports VirtualBox. Our focus is on delivering an enterprise PaaS experience for Cloud Foundry, which includes installation into a number of cloud providers like vSphere/vCHS, OpenStack, AWS, and Google Compute Engine. As part of the experience, we found developers willing to build and use their local tools or to push to private and public instances of Cloud Foundry. Bosh-lite is a tool that offers support for a portion of CF v2 and is used to perform specific tasks such as building BOSH deployable services like a database. It is not a replacement for Micro Cloud Foundry, which is still on our roadmap. Stackato's Micro is based on CF v2 with some proprietary additions. Pivotal itself has two Cloud Foundry PaaS offerings: the online Pivotal Web Services, and the enterprise-oriented Pivotal CF. These are complemented by Pivotal HD and related cloud service offerings, as well as other specialized data offerings such as the Pivotal Greenplum RDBMS, Pivotal GemFire, and Pivotal SQLFire. In addition, Pivotal's acquisition last year of Xtreme Labs has given it a suite of mobile services that integrates with its PaaS and its big data services. As mentioned in the statement by Jamie O'Meara, Pivotal CF runs on VMware, OpenStack, Amazon Web Services, and Google Cloud Platform. The Cloud Foundry Elastic Runtime runs applications in packages called "droplets" in DEAs (Droplet Execution Agents). DEAs are managed by the Cloud Controller and monitored by the Health Manager, while Routers manage application traffic, do load balancing, and combine logs. In turn, DEAs call on service broker nodes, which communicate over a message bus. The Cloud Controller has access to a blob store and a database of application metadata and service credentials. To deploy an application, the developer basically uploads the app bits and metadata, using the Cloud Foundry command line or plug-ins from Eclipse, Maven, or Gradle. In addition, the developer needs to create and bind services. This all boils down to building a WAR archive and uploading the WAR. The Cloud Controller will automatically detect and load any necessary system buildpacks, create a droplet, deploy the application droplet to the DEAs, register the routes, and forward the ports. Once the DEAs are active, the Health Manager compares the expected state of DEAs from the Cloud Controller with the actual state from the DEAs. If the Health Manager detects a deviation, it will ask the Cloud Controller to restart any DEAs not in the expected state. Administrators use BOSH, as opposed to other IT automation tools, such as Puppet or Chef, to manage the underlying infrastructure of Cloud Foundry. An open source tool chain for release engineering, deployment, and lifecycle management of large-scale distributed services, BOSH has its own command line, separate from the cf command line, but you don't need it to deploy an application. BOSH is for deploying VMs, not droplets. At a very high level, BOSH clones new VMs from a "stemcell" to create the VMs needed for a deployment. A stemcell contains an operating system and an embedded BOSH agent that allows BOSH to control VMs cloned from the stemcell. A BOSH release is a collection of source code, configuration files, and startup scripts, with a version number that identifies these components. The BOSH deployment manifest is a YAML file defining the layout and properties of the deployment. 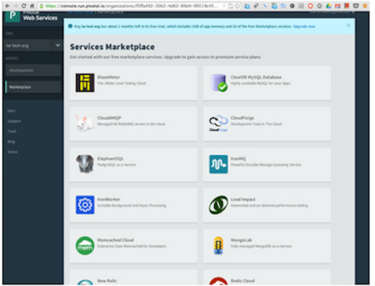 Cloud Foundry includes UAA (User Account and Authorization) and login servers. The UAA is the identity management service for Cloud Foundry. Its primary role is as an OAuth2 provider, issuing tokens for client applications to use when they act on behalf of Cloud Foundry users. However, it can also authenticate users with their Cloud Foundry credentials and act as an SSO (single sign-on) service. 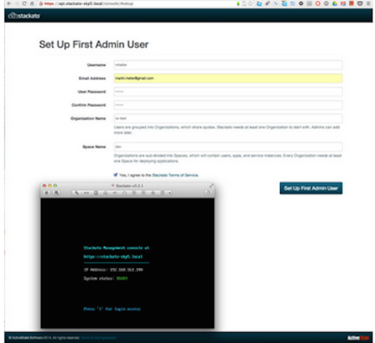 The login server performs authentication for the UAA, acting as a back-end service. The login server is where Cloud Foundry administrators set up their authentication sources, such as LDAP/AD, SAML, OpenID (Google, Yahoo, and so on), or social. Down at the application execution level, the DEA uses Warden Linux containers. Warden provides a simple API for managing isolated, ephemeral, and resource-controlled environments, or containers. In the future, Cloud Foundry will support Docker containers. Figure 1. 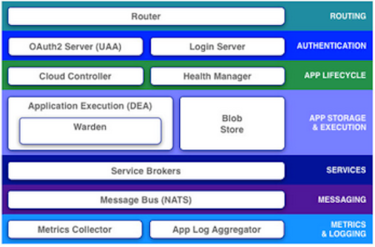 A block diagram of the Cloud Foundry architecture. As you can guess, the buildpack line in the manifest references the Git repository of a PHP and Apache buildpack. Cloud Foundry does messaging among the parts of its environment using NATS, a lightweight and distributed publish-subscribe messaging system written in Ruby. The Cloud Foundry services API defines the contract between the Cloud Controller and the service broker. The broker is expected to implement several HTTP (or HTTPS) endpoints underneath a URI prefix, and it may be load-balanced. User-provided service instances are a mechanism to deliver credentials to applications for service instances that have been pre-provisioned outside of Cloud Foundry -- for example, an Oracle cluster. Pivotal has a big data product, Pivotal HD, that integrates with Pivotal CF. It includes Hadoop, Pivotal's HAWK SQL query engine for Hadoop, and GemFire XD analytics, as well as the Spring for Apache Hadoop Java framework. The Pivotal Big Data Suite is an enterprise data warehouse that includes unlimited Pivotal HD. Figure 2. Services in the Pivotal Web Services Marketplace are typically available in a variety of plans, ranging from free to $100 or more per month. Pivotal also offers a Mobile Services Suite that's integrated with both Pivotal CF and Pivotal HD. This is based on the seven years and 400 apps' worth of know-how acquired with Xtreme Labs last year. It's basically an MBaaS (mobile back end as a service) on Pivotal's PaaS, with the integration extending out to the mobile application level. Signing up for Pivotal Web Services was painless. I had no trouble with the developer console, and downloading and installing the cf command line was a matter of a minute or two. The documentation made the steps needed to deploy an application with cf quite clear. As I mentioned earlier, the Micro Cloud Foundry VM has not yet been updated to Cloud Foundry v2. While I found two methods for installing the current Cloud Foundry open source into a local VM, each promised to be a multihour process. It was much easier for me to download a Stackato Micro Cloud VM (10 minutes) and install it into VMware Fusion on my MacBook Pro (two minutes). I also installed the Stackato command line, which is a superset of cf. Using the Stackato developer console in a browser turned out to be very similar to using the Pivotal Web Services developer console. With the exception of the current lack of a Micro Cloud Foundry VM, which is kind of a pain, installation and setup of Cloud Foundry are very good. Everything you need is available for download, and the installations are self-explanatory. You can start small either online (in a couple of minutes) or on premise and grow your cloud incrementally, or you can install an enterprise cloud on an appropriate VM host in a few hours. For a developer, deploying droplets from the command line, Eclipse, Spring Tools Suite, Maven, or Gradle is dead simple, once you've constructed a valid manifest file that includes any necessary buildpacks. Managing droplets and DEAs is straightforward, though I wish that automatic scaling of applications were fully supported instead of being an enterprise-only beta feature in Pivotal CF. Figure 3. The Stackato Micro Cloud VM -- available for VirtualBox, VMware Fusion, VMware vSphere, and KVM -- is currently the fastest way to get Cloud Foundry on to a developer's desktop. Here the Stackato management console is running behind the Stackato Micro Cloud window. Managing Cloud Foundry clouds isn't hard, but BOSH is a complicated, powerful tool that has a significant learning curve. Administrators accustomed to Puppet and other popular configuration management and orchestration tools won't have any trouble learning BOSH, but they will have to dedicate some time to doing so. Overall, Cloud Foundry is a strong PaaS in its open source form and in both proprietary forms from Pivotal: online as Pivotal Web Services, and on premises as Pivotal CF. While I haven't evaluated all the proprietary PaaS offerings based on Cloud Foundry by Foundation members, I have looked at Stackato from ActiveState and found that it streamlined a few items not yet cooked in the open source edition, adding value for cloud management and language support. This story, "Review: Cloud Foundry brings power and polish to PaaS" was originally published by InfoWorld.